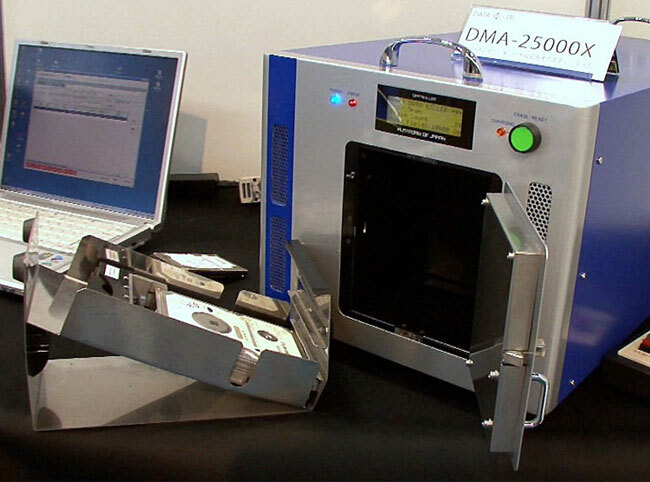 At the Information Security Expo, a new system called Data Killer has been showcased by Platform of Japan, which is able to instantly obliterate data on on computer hard drives and magnetic media. Data Killer is able to clean any size hard disk instantly by changing the magnetic alignments of the data to the same direction. Watch the video after the jump to see just how fast the process happens. The Data Killer systems come in various sizes allowing you to clean a number of disks or drives at the same time. Unfortunately no information on pricing or worldwide availability has been released as yet, but as soon as information comes to light we will keep you updated as always.